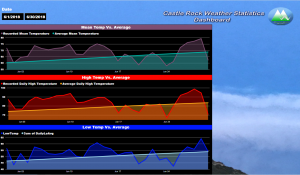 A statistical look and discussion of weather recorded for Castle Rock Colorado. 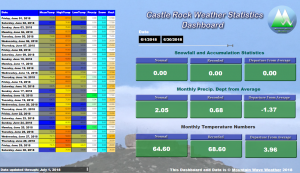 This information was collected and recorded via weather stations, trained storm spotters and NWS reports for Castle Rock, Colorado. 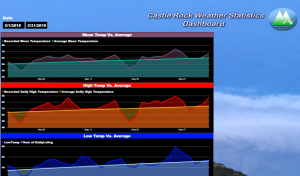 It is in no way an “official” record, just simply what was recorded for Castle Rock. These stats include snowfall, temperatures, precipitation, wind intensity and direction for the month. April 2018 came in as the second month in a row with above average temperatures and below average snowfall. 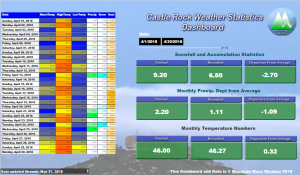 March 2018 and April 2018 are the two snowiest months of the year for Castle Rock and many areas along the Colorado front range. The fact that both were warmer and drier than average could be setting the stage for a long, warm, dry summer. Only time will tell! Here’s a look at the stats for April 2018. Despite the fact that April 2018 finished above average in overall temperature, it wasn’t a huge number. In fact, the month was pretty close to average with a nearly equal number of warm and cool temperature swings. Being a spring month in Colorado, we expect to see months like this so nothing too surprising here. April is our second snowiest month of the year; this means we generally need to see some decent storms to reach average snowfall and this year a couple of decent sized storms moved through, but it simply wasn’t enough. You can see in the graphic above, a couple of storms dropped 2.5 inches while a few other storms had lesser amounts. The bottom part of the graphic shows a red area (where our total snowfall should be for the year) vs. the white line (where our snowfall currently is for the year.) April helped us get a bit closer to average but we still finish the month and the season overall significantly below average on total snowfall. April 2018’s total snowfall finished 2.7 below average. Our spring has been a bit disappointing in terms of snowfall, but the entire season has for that matter. The good news is that there may be a bit of relief on the horizon, models show a period of unsettled weather to start May, so perhaps we can make up a bit of ground on our dry conditions. I’d expect a average to above average precipitation total for May but I see continued warmer than average conditions, hopefully not to the point that it negates any moisture we see! May 2018 finished as a mixed bag for Castle Rock Weather. We saw overall precipitation about average and snowfall slightly above average (although that’s not saying much as May usually sees a tad less than inch of snow accumulation on average.) The big story like so many months this year were the above average temperatures, we finished a bit over 3 degrees above the 30 year average. This always seems like a small number but anything over 2-3 degrees above or below average is considered notable. Here’s a closer look at how the month finished! While we saw a few notable dips in overall temperature, a large majority of the month saw above average temperatures. 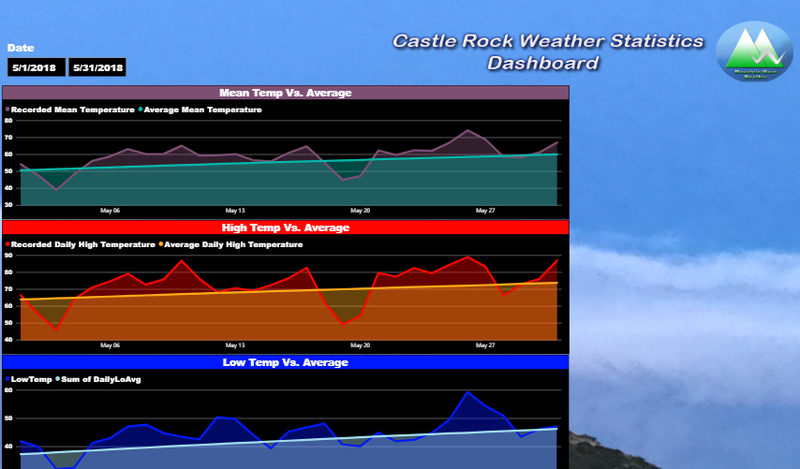 The month finished well above average on daily mean temperature. May 2018 finished above average and continues a trend of above average months reaching back since February 2018. 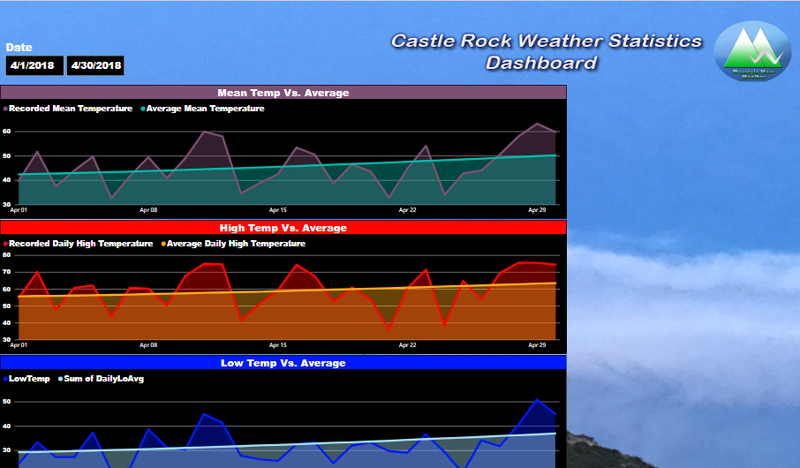 Suffice to say that we had a warm winter followed by a very warm spring across the front range of Colorado. May 2018’s mean temperature finished 3.21 degrees above average and is the third month in a row with an above average mean temperature. 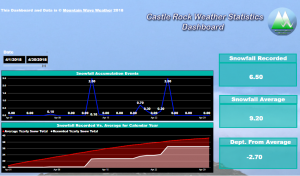 An early snow event in May dropped around an inch of snow for most places in and around Castle Rock. I recall how many comments expressed surprise about seeing snow in May, but contrary to popular belief… it can and does snow often in May along the front range of Colorado. We’ve had much larger storm than this in May but we will take all the moisture we can get! 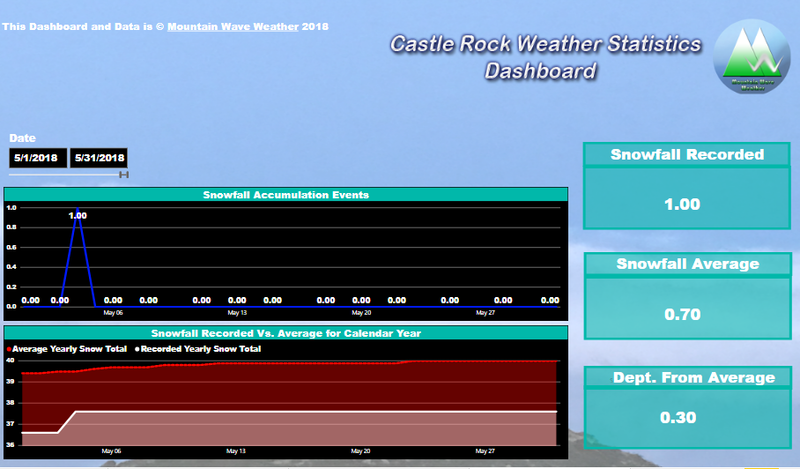 May 2018’s total snowfall finished 0.3 above average. 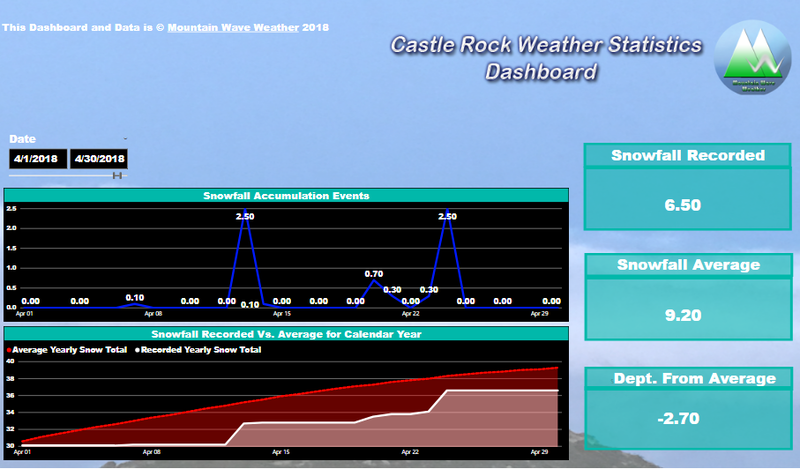 Since we have now entered spring and with the end of May, our official snowfall season we will be tracking liquid precipitation for the remainder of the summer and fall season. 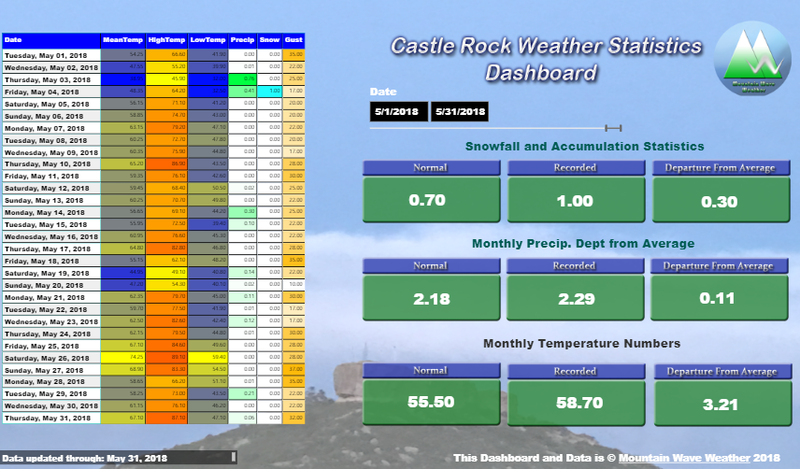 We actually had several rain accumulation events in May 2018 (see the image below for what was recorded for Castle Rock.) The month finished slightly above average, which is good news but with how dry it has been over the past 6 months we really need some well above average months to make a dent in our drought conditions. May 2018’s total liquid precipitation finished 0.11 above average. May 2018 continued the trend of another warm month, which wasn’t the most concerning thing. What we continue to monitor is the dry conditions, while we had a couple of slightly above average months in terms of rain and snow, the fact is that it hasn’t been enough or sustained long enough to relieve our dry conditions. Our latest drought monitor update shows improvement in drought conditions across NE Colorado. 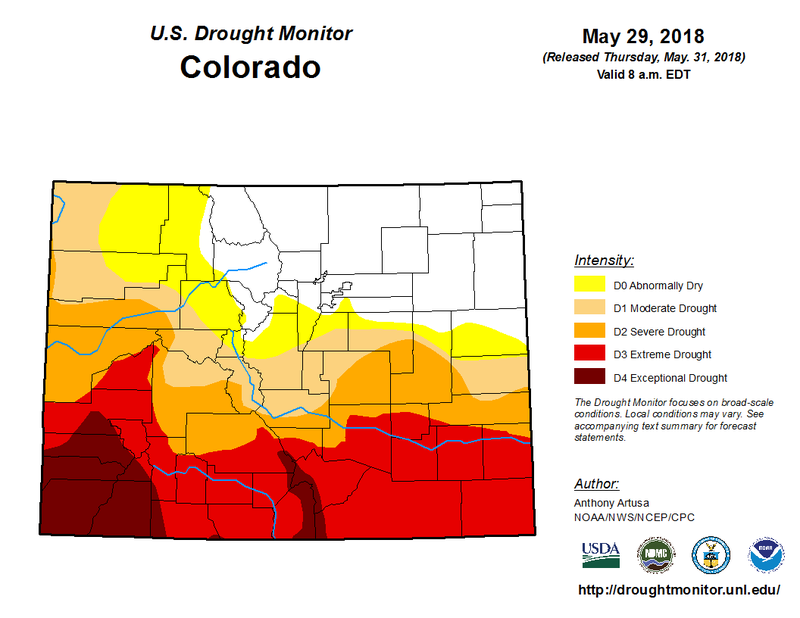 The Palmer Divide however remains drier than average and Southern and SE Colorado are still experiencing extreme to exceptional drought. As May comes to an end and we transition into the more summer pattern of June I suspect we will dry out significantly and temperatures will heat up. A lot of guidance puts the chance of June experiencing above average and record setting temperatures for Eastern Colorado as high to very high. This means expect a warm and dry June, especially the first half of the month. By the second month we will have to keep an eye on if the monsoon kicks in early or if we continue the dry pattern into July. June 2018’s mean temperature finished 3.96 degrees above average and is the fourth month in a row with an above average mean temperature. 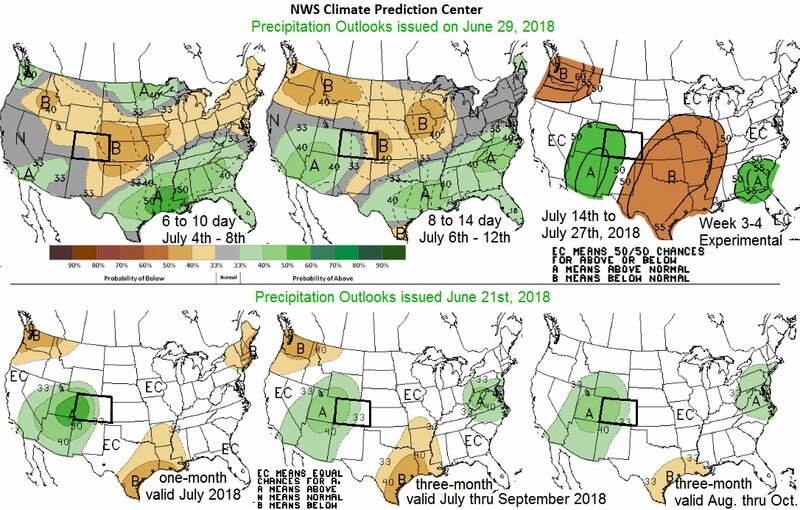 Historically, June is a wet month and the pattern is that we usually see a lot of that moisture fall in the first half of the month when severe weather season ramps up. 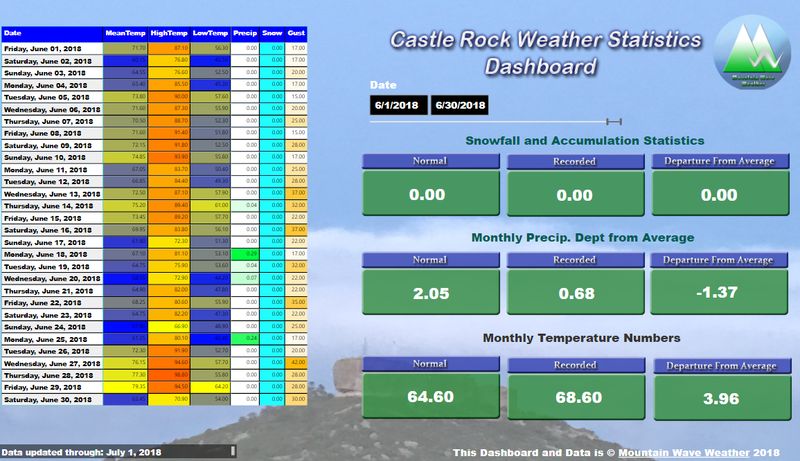 June 2018 was very dry the first half of the month with no precipitation recorded in Castle Rock until June 14. After that, a few storms brought a couple of healthy doses of rain in the .25 inch range, but even that is not enough to erase our dry conditions and make up for months of below average precipitation stemming all the way back from last fall. No precip recorded until the middle of the month, but a couple of storms brought rain the last half of June. June 2018’s total liquid precipitation finished 1.37 inches below average. June 2018 continued another pattern of warm and dry months for Colorado. We received a little bit of rain but record high temperatures and windy conditions couldn’t help us put a dent in drought conditions along the Palmer Divide. The moisture did however, help us keep the drought from getting worse. The latest outlooks from the CPC show a better than average chance for above average moisture for Colorado, mainly a bit later in July. The first week or two of the month look very warm and dry with the data we are seeing. July is the start of the monsoon season in Colorado. 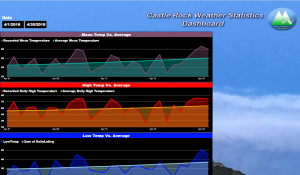 Southwesterly flow carries heat but also moisture into Colorado. July is our warmest month of the year on average and one of our wettest thanks to the monsoon pattern. Indications are we will see a decent monsoon pattern this year, but we don’t yet know when it will kick off or how sustained it will be. The probability (as seen above) is that we finish slightly above average on precipitation for the monsoon season, which means we should expect to see rain kick off later in July with continued very warm temperatures. 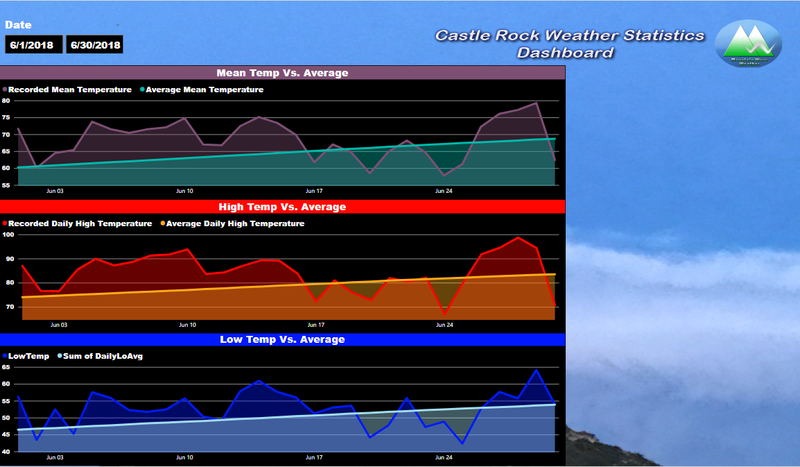 Keep an eye out for updates for the day to day and week to week weather highlights on Mountain Wave Weather!